6 Inch 442 CFM Duct Inline Fan Blower: Made with quality UL components for quiet operation. Composite fan blades and center hub which reduces noise and vibration. 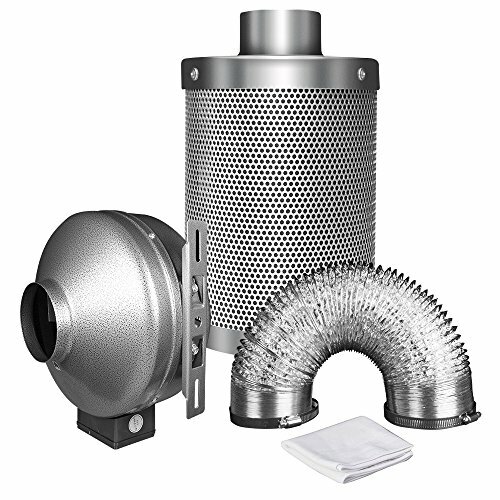 6 Inch 1050+ IAV Australia Charcoal Filter: One of the world's most absorbent carbon available; Dimensions: 6" Flange Ducting x 16" Length; Reversible flange. 6 Inch 25 Feet Uninsulated Aluminum Ducting + 2 Stainless Clamps: Flame-retardant coating and corrosion-resistant wire helix; Temperature endurance range from 0 ~ 185°F. (-18℃ ~ 85℃). FREE Pre-Filter included: We recommend replace the Pre-Filter every 6 months to protect your filter. Multi-Functional: This ventilation combo removes heat and eliminate the undesirable ill-smelling odors in the grow tent to solves air delivery problems without major system rework or expense.